In the UK there are a number of rules and regulations governing the generation, storage and removal of commercial and industrial waste. Whether it is from a residential or commercial premises, these regulations must be adhered to in order to comply with the law. From the moment you produce the waste until the moment you hand it over to an official waste management business it is your responsibility and even after that, you are still responsible to check the waste management company is followings its own duty of care. Whilst the rules aren’t complex, it is important to understand them in their entirety as breaching can result in hefty fines. This article offers a step by step guide to abiding by those rules, along with some handy tips for managing your industrial waste. Firstly, it’s important to categorize your waste into hazardous and non-hazardous. If any of the waste is hazardous you must get a permit to store, treat and dispose of the waste and register the premises as a producer or storage site of hazardous waste. Construct a waste management plan, using the ‘waste hierarchy’ in an attempt to reduce your waste footprint or dispose of it in an environmentally friendly manner. Aim to minimise your waste, particularly the amount of hazardous material you use. Re-use and recycle as much as possible or use energy recovery waste disposal systems wherever possible. Finally, if there are no alternatives, dispose of the remaining waste in landfill or incinerators. The next step is to check whether or not your company requires any licenses or permits for your waste management operations. In most situations you will need to register for an environmental permit or an exemption, which you can do online. If you plan to house a skip on the road outside your site you are also required to apply for a permit from your local council. Any drivers of the vehicles or machines you operate must also have the necessary permits or licenses. If you or your business produces less than 500kg of waste annually, then there is no need to register. The next stage is to sort and store your waste appropriately. Hazardous waste and non-hazardous waste must be kept separately, as much different types of hazardous waste and different types of waste oil. Often, non-hazardous waste should also be stored separately for the purposes of disposal and recycling. The waste must then be stored safely and securely, in clearly labelled and covered container that prevents it being blown or washed away. Take particular care over liquid hazardous waste that may be prone to leak. Clear records should also be kept on what is being stored, how long it is being stored for and where it is being stored. Waste containers should be labelled with clear instructions on the storage and disposal of the waste. Regularly check your waste storage for leaks and other risks and carry out any maintenance necessary. The next step involves transporting your waste. Either hire a licensed waste collection company to collect and dispose of you waste or get a license to transport your own. If you plan on moving your own waste, ensure you have the right vehicle to do so. Consider hiring a waste tipping skip from a company such as UK Forks, in order to store and load the skip onto a lorry for removal. Once more, take extra care if you moving hazardous waste as your responsibilities are extended. Use separate collection units for different types of recyclable material. 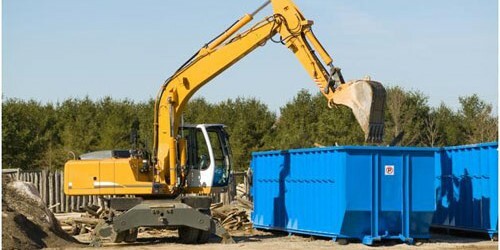 When moving waste between counties, note that you will not be able to export waste for disposal. Finally, it is time to dispose of your waste. If you have hired a waste collection company to dispose of your waste, ensure they are following their duty of care. If you are disposing of it yourself, ensure you have the right permits to send your waste to landfill. Recycle wherever possible, or find the most environmentally friendly way of disposing of the waste. Again, hazardous waste and non-hazardous waste should be treated differently. Check with your local council for more information.